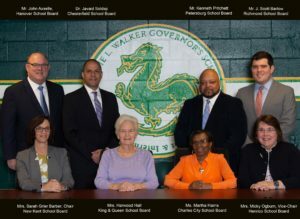 A meeting of the Maggie Walker Governor’s School Regional Board and Budget Adoption will be held on April 18, 2019, @ 9:00 am, in Room 153 on the MW campus. Persons wishing to address the Regional School Board are required to contact the Board Clerk for placement on the agenda. In order to address the Regional School Board, the speaker must provide the Clerk with a summary of his/her comments by 10:00 am on the last business day prior to the meeting at which he or she desires to be heard. The April packet can be viewed here.